It’s getting hot out there! And of course, what’s the best refresher during the summer? Pool time! Whether just at your neighborhood pool, or going on a tropical vacation, pool safety is extremely important. So what’s the easiest way to make kids water safe? As a swim teacher, I can tell you a few easy tips on making your children pool ready! One of the best tricks to get your children to be able to swim far, is to make sure they are looking down at the bottom of the pool while they’re swimming. 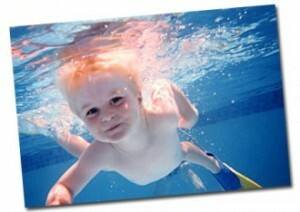 By doing this, your kids are saving energy and swimming on top of the water, which will ensure more speed. Another trick is teaching them how to back float so that when they are tired in the middle of the pool, they can simply flip onto their back and be safe and saving energy. Other than that, practice makes perfect! The more you swim with your kids, the more they’ll love it, and in turn, the better they’ll be! Also, private swim lessons are a great option for many kids, because then not only are they learning how to swim, but they’re also swimming with other people. This increases comfortability in the water and shows them that no matter who they’re with, they’re pool safe! Go swim! Next: Next post: Make Fun Reading for kids!